Potassium is essential for good nutrition and health. A diet low in potassium and high in sodium may be one of the factors that can lead to high blood pressure or hypertension which can boost your odds of having a heart attack or stroke. Newer evidence suggests that dietary potassium may play a role in decreasing blood pressure. Potassium is involved in nerve function, muscle control and blood pressure. Increasing potassium in the diet may protect against hypertension in people who are sensitive to high levels of sodium. 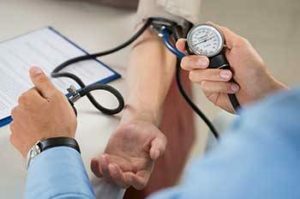 A moderate increase in dietary potassium, in addition to a reduction of excess sodium, may be beneficial, especially for people at risk for hypertension. Eating a variety of potassium-rich foods daily is recommended. Most Americans do not get enough potassium in their diets. The recommended daily potassium intake for adults is 4.7 grams or 4700 milligrams a day. While sodium is added to most highly processed foods, potassium is not. Eating more fresh and frozen foods, which are usually lower in sodium, may be helpful. Many foods contain potassium, including meats, some types of fish (such as salmon, cod, and flounder), and many fruits, vegetables, and legumes. Low-fat dairy products like milk and yogurt are also good sources of potassium. More examples of potassium-packed foods are: green leafy vegetables like spinach, Swiss chard and beet greens. Deep orange vegetables like butternut squash and sweet potatoes and even mushrooms. Fruits like bananas, cantaloupe, and strawberries. Fish like clams, halibut, and pacific cod. Beans include lima beans, edamame, kidney, navy and pinto beans. Dried fruit like raisins, dates, apricots, and prunes. For breakfast a serving of oatmeal and light yogurt or whole grain cereal with fresh fruit. For lunch a green salad with lots of vegetables, lean protein and fresh fruit. For dinner some baked fish, asparagus, a whole wheat roll and low fat milk. Snack examples include light string cheese, fresh fruit or a handful of unsalted almonds. Some individuals may need to restrict their dietary potassium intake due to certain illnesses. Having too much or too little potassium in the body can have very serious consequences. The kidneys regulate the level of potassium in the body. Having low potassium levels or hypokalemia is uncommon in people who eat a healthy diet. But potassium deficiency may result from excessive potassium losses due to severe vomiting or diarrhea, poor diabetic control, very low-calorie diets for example less than 800 calories per day, chronic alcoholism, hard exercise, or due to some diuretics and laxatives. If you take certain diuretics, you may need more or less potassium. Ask your physician about the type of diuretic drug you take and whether you require additional potassium for example a prescribed potassium supplement to help replace potassium loss.